This was taken around 8am on 27th October 2017 from Paxton's Tower (NGR: SN5410919159), overlooking the Tywi Valley between Carmarthen and Llandeilo. 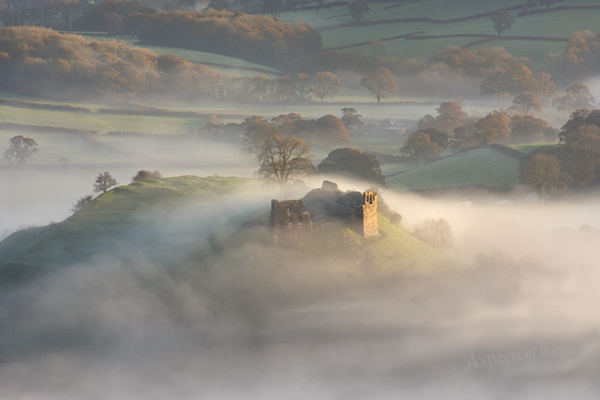 This was only the second time I'd visited this location and both times I was lucky enough to witness the castle surrounded by a sea of mist. Dryslwyn Castle was taken from the Welsh by King Edward I in 1287, but was surrendered to Owain Glyn Dwr in 1403. Canon EOS 40D, 55-250mm lens at 220mm, F11 at 1/50 second. Manfrotto tripod.